A file with the AST file extension is most likely an Ability Spreadsheet Template file used in the Ability Office software for creating multiple, similarly-formatted Ability Spreadsheet (.AWS) files. The WordPerfect word processor software uses AST files as template files too, but this program is more commonly associated with WordPerfect Template files (.WPT). Another use for AST files might be for Adobe Color Separations Table files used by a few Adobe products for exporting data to the PDF format or to a different program. It looks to be an obsolete format but you can read a little more information on it in the Adobe Photoshop File Formats Specification. AST also stands for Audio Stream and may be used on Nintendo's GameCube and Wii video game consoles. AstroGrav Simulation Data files, ClarisWorks Assistant files, and Technics Sx KN 6000 Keyboard All Custom Memory files are all formats that have the .AST file extension appended to their files too. 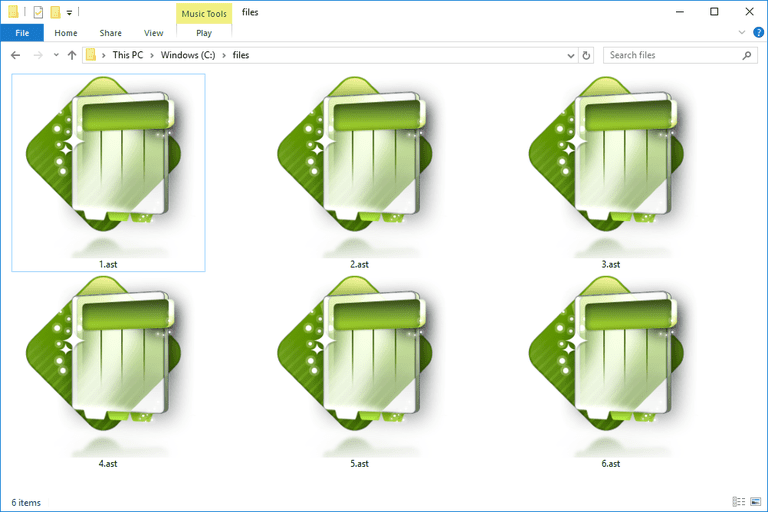 Ability Spreadsheet, a spreadsheet program that installs as part of the Ability Office suite, is the program used to open template files in the AST format. This format is kind of like a ZIP file that holds the file's contents, so you could also use a file unzipper like the free 7-Zip tool to open the AST file, but doing this will just let you see the different components of the file and not actually use it with Ability Spreadsheet. Corel's WordPerfect Office Suite is used to open template files made for that software. AST files used with Adobe products can be opened in Adobe Photoshop, Adobe Illustrator, and Adobe Acrobat. I don't know what software, if any, can open AST files that are Audio Stream files used with video game consoles. Something you might try is opening the file in VLC, which is a media player known to support lots of audio and video formats. Another option that might work is to use ast_multi, but I don't have any information on how that command-line tool works. The solar system simulation software AstroGrav opens AST files that are Simulation Data files. ClarisWorks Assistant files are kind of like template files that the AppleWorks office suite software (originally named ClarisWorks) uses to help build things like calendars, presentations, and business cards. You can open these AST files with Apple's AppleWorks software, but it's been discontinued since 2007 and may not run on your Mac version. It's possible that the Apple Productivity Apps (iWork) software can open these kinds of AST files but I'm not positive. Technics Sx KN 6000 Keyboard All Custom Memory files have something to do with the Sx KN 6000 piano keyboard. The keyboard was developed by Technics but is now owned by Panasonic. Two other file formats used by Photoshop include ASE and ASL, and MST and ASF are two non-Photoshop formats that looks very similar to AST, but none of those file types can open in the same way as any of these aforementioned AST files. If you can't open your AST file using these suggestions, be sure you're not misreading the file extension. Considering the number of programs that support formats that use the AST extension, you may find that a program you have installed that opens AST files isn't the one you'd like to use. In those cases, see How to Change File Associations in Windows for help on what to do. Ability Spreadsheet can save an open AST file to a number of formats like Ability Spreadsheet's own AWS format, Microsoft Excel's XLSX, XLS, and XLSM formats, and others like WK, DOC, TXT, PDF, and CSV. WordPerfect can surely convert AST files too, probably through the menu like a File > Save As option. I don't think there's any way to convert Adobe Color Separations Table files to any other format. Although it's used in a few Adobe products, I don't see it being functional under any format other than the one it's in. The AstroGrav software can create a movie of a simulation and save it as an AVI or MOV video file. This is possible through the Tools > Create Movie... menu. As for Audio Stream files and ClarisWorks Assistant files, I recommend using the information from above to open the files (if you can) and see if there's an Export or Save As menu anywhere to be found. This is generally how that type of software converts files to other formats. I'm sure that AST files used with the Sx KN 6000 keyboard need to remain in that file format and so shouldn't be converted. More common file extensions can usually be converted much easier with a free file converter, but I don't think AST files in any of these formats are supported by those types of file converters.